Baroness Tanni Grey-Thompson has praised the decision for Russian athletes to remain banned from international competitions. The IAAF upheld the country’s suspension into 2019 after the governing body banned Russia in November 2015 because of evidence of state-sponsored doping. “The IAAF has taken a really important stance,” said Grey-Thompson. The ban will be in place until samples and data from Moscow’s former anti-doping laboratory are made available. The decision puts the IAAF at odds with other sporting bodies such as the World Anti-Doping Agency and the International Olympic Committee, who have revoked their own suspensions of Russia. The IAAF ruling means Russian athletes will not be able to compete under their own flag at the European Indoor Championships in February. Grey-Thompson is one of the finest track Para-athletes of all time. She won 11 gold medals over five Paralympic Games and 16 medals in all and two World Championships during her career. 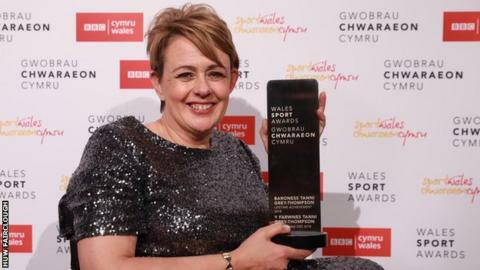 Grey-Thompson spoke to BBC Sport Wales after receiving the Lifetime Achievement award at the Wales Sport Awards. “There are a lot of challenges in sport at the moment for Wada; UK Anti-Doping here are doing a strong job,” said Thompson. “The views of athletes need to be respected and they do have a strong view on this because it affects their lives and careers and everything. “Under Seb Coe (president), the IAAF are doing the right thing. “Russia should have the chance of coming back, they should have a chance of redemption but they have to prove that first. “We also have to try and recognise that is not just Russia.